Background Viral myocarditis is a common cause of transient electrocardiogram (EKG) abnormalities in children. The clinical presentation of acute myocarditis ranges from asymptomatic infection to fulminant heart failure and sudden death. Many children present with nonspecific symptoms such as dyspnea or vomiting, frequently leading to misdiagnosis. EKG abnormalities are a sensitive indicator of acute myocarditis and are present in more than 90% of cases. 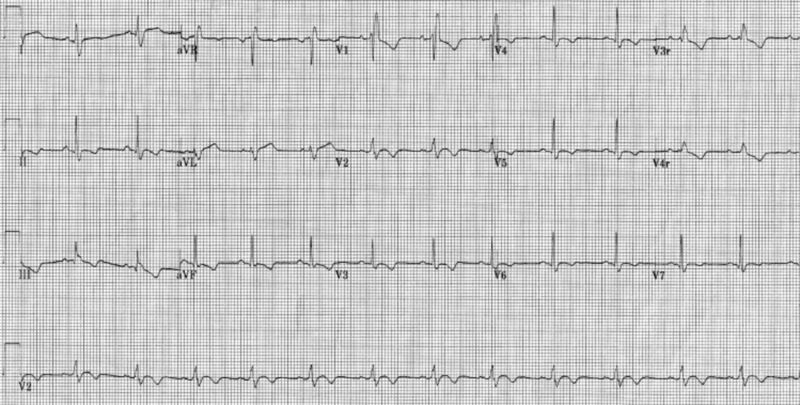 Case Report A 13-year-old female suffered a syncopal episode and was found to have high-grade atrioventricular (AV) block caused by acute presumed viral myocarditis. With close monitoring, the EKG abnormalities resolved over the following 48 hours. In this case report, we discuss the incidence, pathogenesis, and outcomes of conduction disturbances in acute myocarditis. Conclusion High-degree AV block can occur in patients with acute myocarditis, and higher-degree AV block is correlated with greater myocardial injury. Additionally, severity of pathological changes may reflect the reversibility of AV block. In the majority of cases, however, this rhythm disturbance is transient and does not require permanent pacemaker placement. Viral myocarditis is a common cause of transient electrocardiogram (EKG) abnormalities in children.1 The clinical presentation of acute myocarditis ranges from asymptomatic infection to fulminant heart failure and sudden death. Many children present with nonspecific symptoms such as dyspnea or vomiting, frequently leading to misdiagnosis.1-6 EKG abnormalities are a sensitive indicator of acute myocarditis and are present in more than 90% of cases.7 However, high-degree heart block occurs in only 23%-33% of cases.7,8 Although transvenous pacing may be required during the acute stage of infection, most patients recover without the need for definitive pacemaker implantation.9 Infectious myocarditis should be considered when physicians encounter a patient with high-degree heart block. A 13-year-old girl was admitted to the hospital following a syncopal episode. Witnesses reported that she complained of dizziness immediately prior to briefly losing consciousness, but she denied chest pain, palpitations, or dyspnea. Five days prior to the syncopal episode, she developed an influenza-like illness consisting of subjective fevers, emesis, diarrhea, rhinorrhea, and sore throat. She took guaifenesin and pseudoephedrine for symptom relief. She had no history of significant medical illnesses prior to this event and no family history of heart disease or sudden death. An initial EKG performed in the field showed a high-degree atrioventricular (AV) block with a ventricular rate of 40 bpm. Upon arrival to the emergency department, she was afebrile, her blood pressure was 100/60 mmHg, and she had normal heart and respiratory rates along with normal oxygen saturation. She was awake and responsive, and with the exception of nasal congestion, no abnormalities were detected upon complete physical examination. Laboratory studies were remarkable for a troponin level of 2.64 μg/L, a white blood cell count of 7,400 μL with 48% lymphocytes, mildly elevated aspartate aminotransferase of 53 U/L, and elevated C-reactive protein at 5.3 mg/L. Serum electrolytes and brain natriuretic peptide levels were within normal limits. A chest x-ray showed an appropriate cardiac size and silhouette. Echocardiogram demonstrated a small pericardial effusion but normal anatomy and function. Multiple laboratory studies were ordered, but a causative pathogen was not identified. The patient was given 2 g/kg intravenous immunoglobulin (IVIG) and closely monitored over the following 48 hours. A temporary pacing catheter was placed as a precautionary measure given the high-degree AV block noted on her initial EKG, but pacing was not required. Serial EKGs over the course of admission demonstrated gradual resolution of the initial conduction abnormalities (Figures 1 and 2). Finally, an episode of nonsustained ventricular tachycardia was noted by telemetry early in her hospital course. Oral amiodarone was administered and tapered over the month following her discharge. Following amiodarone taper, the patient made a full recovery without any recurring cardiovascular symptoms or abnormal electrocardiographic findings (Figure 3). 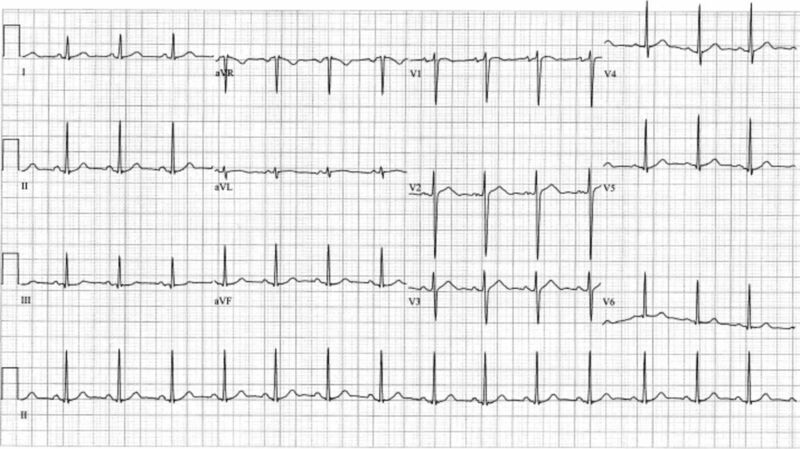 Electrocardiogram of the patient at presentation demonstrating high-degree atrioventricular block. Electrocardiogram of the patient demonstrating the resolution of the atrioventricular block. Electrocardiogram of the patient at follow-up demonstrating normal sinus rhythm. High-degree AV block can occur in patients with acute myocarditis, and higher-degree AV block is correlated with greater myocardial injury. Additionally, severity of pathological changes may reflect the reversibility of AV block. In the majority of cases, however, this rhythm disturbance is transient and does not require permanent pacemaker placement. (12, 2007) Pediatric myocarditis: emergency department clinical findings and diagnostic evaluation. Pediatrics 120(6):1278–1285, pmid:18055677. (11, 1958) Severe generalized disease (encephalohepatomyocarditis) occurring in the newborn period and due to infection with Coxsackie virus, group B; evidence of intrauterine infection with this agent. Pediatrics 22(5):857–875, pmid:13600914. (1965) An experimental approach to virus myocarditis. Prog Med Virol 7:97–115, pmid:5318283. (3, 1966) Adult heart disease due to the Coxsackie virus group B. Br Heart J 28(2):204–220, pmid:4378154. (8 3, 1995) A clinical trial of immunosuppressive therapy for myocarditis; The Myocarditis Treatment Trial Investigators. N Engl J Med 333(5):269–275, pmid:7596370. (10, 1996) Viral myocarditis: balance between viral infection and immune response. Can J Cardiol 12(10):935–943, pmid:9191484. (11 9, 2000) Myocarditis. N Engl J Med 343(19):1388–1398, pmid:11070105. (7, 1992) Viral myocarditis mimicking acute myocardial infarction. J Am Coll Cardiol 20(1):85–89, pmid:1607543. (Sep-Oct 2003) The clinical course of acquired complete heart block in children with acute myocarditis. Pediatr Cardiol 24(5):495–497, pmid:14627323. (2008) Molecular biology and pathogenesis of viral myocarditis. Annu Rev Pathol 3:127–155, pmid:18039131. (7, 1994) Acute myocarditis. Rapid diagnosis by PCR in children. Circulation 90(1):330–339, pmid:8026015. (3, 1997) Human parvovirus B19 infection associated with severe acute perimyocarditis in a 34-year-old man. Eur Heart J 18(3):524–525, pmid:9076392. (4, 2011) Prognostic electrocardiographic parameters in patients with suspected myocarditis. Eur J Heart Fail 13(4):398–405, pmid:21239404, Epub 2011 Jan 14. (8, 1999) Clinical outcomes of acute myocarditis in childhood. Heart 82(2):226–233, pmid:10409542. (11, 1994) Serial electrocardiographic findings in acute myocarditis. Intern Med 33(11):659–666, pmid:7849377. (12, 2008) Myocarditis complicated by complete atrioventricular block: nine years' experience in a medical center. Pediatr Neonatol 49(6):218–222, pmid:19166118, Erratum in: Pediatr Neonatol. 2009 Feb;50(1):39. (12, 2008) Myocarditis and complete atrioventricular block: rare, rapid clinical course and favorable prognosis? Pediatr Neonatol 49(6):210–212, pmid:19166116, Erratum in: Pediatr Neonatol. 2009 Feb;50(1):39. (5 19, 2009) Viral myocarditis: from the perspective of the virus. Circulation 119(19):2615–2624, pmid:19451363. (6, 1987) Myocarditis: the Dallas criteria. Hum Pathol 18(6):619–624, pmid:3297992. (3, 1981) Idiopathic acute myocarditis with complete atrioventricular block in a baby. Clinicopathological study of the atrioventricular conduction system. Jpn Heart J 22(2):275–280, pmid:7230527. (Sep-Oct 2002) Complete atrioventricular block following myocarditis in children. Pediatr Cardiol 23(5):518–521, pmid:12189408. (11 29, 2005) Intravenous Amiodarone Pediatric Investigators. Intravenous amiodarone for incessant tachyarrhythmias in children: a randomized, double-blind, antiarrhythmic drug trial. Circulation 112(22):3470–3477, pmid:16316969. (2005) Intravenous immunoglobulin for presumed viral myocarditis in children and adults. Cochrane Database Syst Rev (1):CD004370, pmid:15674945, Jan 25. (2011) (2011) The follow-up evaluation of electrocardiogram and arrhythmias in children with fulminant myocarditis. Circ J 75(4):932–938, pmid:21343655, Epub, Feb 18. (5, 1994) Intraventricular conduction abnormalities in patients with clinically suspected myocarditis are associated with myocardial necrosis. Am Heart J 127(5):1290–1297, pmid:8172058. (10, 2004) Long term follow up of children with myocarditis treated by immunosuppression and of children with dilated cardiomyopathy. Heart 90(10):1167–1171, pmid:15367516.